While the west continues to lecture Palestinian resisters for their ready resort to violence, more hunger-strikers approach death in Israeli prisons. Why are these courageous people going unnoticed by the rest of the world? Why isn’t their treatment sparking international outrage or at least prompting a debate? “Silence is complicit”, read one of the signs raised by protesters in front of UN offices in Ramallah. The young men and women in solidarity with Palestinian hunger strikers were sending a message to the UN and to the world: your silence could kill them. In a way, that is very true. The lives of four Palestinian hunger strikers are hanging in the balance, teetering between life and death. Two in particular – Samer Issawi and Ayman Sharawneh have crossed the 200-day mark without food. The sheer number of days is staggering, difficult for any person to wrap their heads around. And still, the world is more or less disgracefully quiet. The Palestinians have a right to be angry. The Palestinian prisoner issue has been shuffled aside, ignored and sidelined for years now. International human rights organizations have admitted that grave violations of human rights have taken place behind Israeli bars but Israel has never been held accountable. While tens of thousands of Palestinians have suffered in Israeli prisons over the decades since the Israeli occupation of 1967, recently, a heroic few have brought this issue back to the fore. Last year, Khader Adnan waged a 66-day hunger strike to protest Israel’s administrative detention policy, which allows Israel to imprison Palestinian political prisoners without charge for an indefinite period of time. Adnan’s strike, which ended in his eventual release and an Israeli promise not to renew his detention, encouraged others silently suffering the same fate to walk in his footsteps. Today, Samer Issawi, on hunger strike for over 200 days, is most likely dying. Medical reports and lawyer visits tell a haunting tale of a man who has lost more than half of his body weight, is suffering from excruciating muscle and joint pains and who can no longer stand on his own. Ayman Sharawneh is also in grave medical condition, having been rushed to Israel’s Soroka Hospital after days in isolation in a Beer Sheva-area prison. Tareq Qadan and Jaafar Izzedin are also on hunger strike, weak but determined. In a letter to his people, Samer Issawi shows that despite his weak body his is still strong-willed. Samer, freed in the Shalit prisoner swap between Hamas and Israel in October 2011, was re-arrested in July 2012 on a technicality. Issawi, who was ostensibly banned from entering the Jerusalem-area town of Al Ram, was ‘caught’ there and detained for violating the terms of his release. Israeli prison authorities informed him he would have to serve out the remainder of his original sentence of 20 years. And so, he stopped eating at the beginning of last August, refusing to accept the unjustness of his situation. It has even taken Palestinians too much time to rise up in protest. Since the prisoners began their hunger strike, there have been solidarity activities, tents and confrontations with the Israeli army in their name, but it has not been until recently that the real protests have begun. Khader Adnan declared his own hunger strike in solidarity, holed up in the Red Cross office in Ramallah and Ayman Sharawneh’s family have all stopped eating in solidarity with their son. But, with the exception of the few and far between statements of ‘concern’ for the lives of the prisoners, the international community has said nothing. And so, coupled with their genuine concern for the lives of their brothers, husbands, sons and comrades, the Palestinians are enraged that the world would sit back and watch these good men die. Even if one of them perishes, the Palestinians will surely hold the world accountable for not stepping in and saving them. Those who have not lived through such a struggle and under such harsh and inhumane circumstances cannot fully understand the significance of this act. These brave men are not starving to death just for their own sakes. For most, that would never be enough. But for those dedicated to the cause and to Palestine, this is the price of freedom they are willing to pay. Tags: hunger strike, israel, Joharah Baker, Palestinian. Filed under israel and palestine articles by Father Dave on Mar 8th, 2013. Comment. Palestinian-only buses launched in Israel?! Zionists are always keen to reject any suggestion that the state of Israel is practicing Apartheid. Indeed, in California it is illegal to even us the word ‘Apartheid’ in connection with the State of Israel! Even so, it’s hard to think of anything that characterises an Apartheid regime better than a bus service restricted to one race of people! The transport ministry claims, of course, that the intention of the new service is simply to ease congestion and that no one will be denied entry to the regular bus service on the basis of their race. Even so, according to this report from Ynet, Palestinians who choose to travel on the so-called “mixed” lines, will be asked to leave them. Racial segregation or transportation mitigation? The Transportation Ministry announced that starting Sunday it will begin operating designated lines for Palestinians in the West Bank. The bus lines in question are meant, according to the ministry, to transport Palestinian workers from the West Bank to central Israel. The ministry alleges that the move is meant to ease the congestion felt on bus lines used by Jews in the same areas, but several bus drivers told Ynet that Palestinians who will choose to travel on the so-called “mixed” lines, will be asked to leave them. The Transportation Ministry defended the plan, saying it was the result of reports and complaints saying that the buses traveling in the area were overcrowded and rife with tensions between the Jewish and Arab passengers. The ministry reportedly considered several alternatives before deciding to opt for designated lines – knowing that the issue of so-called “Palestinian lines” would be highly controversial. Still, the ministry eventually decided to launch the lines, which will run from Eyal crossing – near the West Bank city of Qalqilya – to Israel. The Judea and Samaria Police is reportedly gearing for the move as well, and will deploy additional forces in Eyal crossing to maintain public order. The Transportation Ministry issued the following statement: “The new lines are not separate lines for Palestinians but rather two designated lines meant to improve the services offered to Palestinian workers who enter Israel through Eyal Crossing. Tags: bus, bus lines, israel, israeli apartheid, Palestinian, state of israel. Filed under Israel and Palestine, israel and palestine conflict by Father Dave on Mar 4th, 2013. Comment. Israeli women assault a Palestinian woman in broad daylight! The Palestinian woman was punched by one passing Jewish woman in an unprovoked attack, before the Jewish woman’s friends joined in, managing to tear off the Palestinian’s headscarf off as they rained blows on her body. 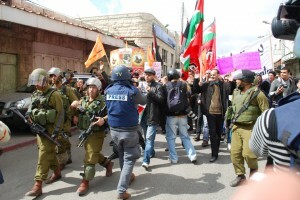 There were more than 100 Orthodox Jews including Yeshiva students who watched an Arab woman being beaten," Dotan said. "She was escorted by an elderly man before a heated argument erupted and people shouted. I couldn’t understand the motive behind that, and all of a sudden they all attacked the Arab woman beating her severely." Hate crimes are not uncommon for Palestinians living in Jerusalem or in the ’48 territories. Ynet reported that on February 24, a Palestinian man in his 40’s who works for the Tel Aviv Municipality as a street cleaner was assaulted by 20 Jewish youth, who targeted his head. In the aftermath of the lynching, Israeli police arrested several Jewish teenagers, the youngest being 13 year old. One of the suspects, a 15 year old, defiantly told the court, "For my part he [Julani] can die. He’s an Arab." Nimrod Aloni, the head of one of Tel Aviv’s colleges for the Institute for Educational Thought said of the mob attack, "This is directly tied to national fundamentalism that is the same as the rhetoric of neo-Nazis, Taliban, and K.K.K. This comes from an entire culture that has been escalating toward an open and blunt language based on us being the chosen people who are allowed to do whatever we like." Tags: Arab, father roy, Jewish, Palestinian, palestinian man. Filed under israel and palestine articles by Father Dave on Mar 4th, 2013. Comment.